She loves to play Tagore songs and dreams of lending a Mandarin touch to the bard’s tunes. They could serve as a bridge between the two ancient cultures, helping people from the respective countries realize the affinity in their music. Chinese musician Liu Yuening , who plays the Yangqin — a santoor-like instrument with its origin in the Middle-East — shared the stage at the Town Hall with singer Prateek Choudhury on Wednesday. But Yuening, an acclaimed music researcher, is bent on striking a melodic partnership between Indian and Chinese musicians. “A few minor alterations to a Tagore song can convert it into a Chinese rhythm which could be readily appreciated by listeners in our country. I have been playing these tunes in China and would love to do it in Kolkata where everyone swears by Tagore. I expect this to pave the way for a collaboration between classical singers from India and traditional musicians from China. They have a lot of common ground to work on,” said Yuening. Based in Beijing, she started learning yangqin at the age of nine. By the time she was 12, Yuening had been hailed as one of the leading yangqin players in the world. She went on to do a doctorate from Hungary, where she spent two years researching music. In 2009, she spent seven months at the University of Delhi for a cultural research programme as an Asia Fellow of the Ford Foundation. It was during this stint that Yuening chanced upon the santoor and was taken aback by the similarity between the instruments. “Yangqin originated in the Middle-East and has its European and Chinese variants. 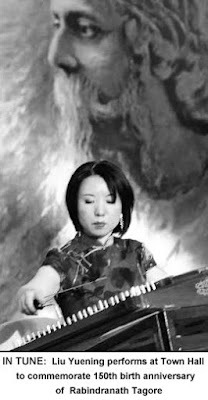 In India, it’s the santoor... music in the region has common roots,” said Yuening. It launched her on a mission to identify the commonalities in Indian and Chinese music. “First, the musical scale in our notes is similar. Secondly, the inspiration behind Indian classical music and Chinese traditional scores is the same — nature. Finally, both India and China have a strong folk music culture and draw heavily from it. These left me convinced that there would be a common origin, a starting point which unites our music,” explained the musician. The quest brought her back to India in 2010. Yuening travelled to Kashmir for a lecture on Chinese music. “The people there were quite receptive and showed interest in my music. I got little chance of exploring the area, though,” she said. She rounded off her trip with a concert in Kolkata. “The visit gave me the chance to study Tagore songs more carefully. I kept playing the tunes and hit upon the idea of giving them a Chinese touch. Even my friends in India thought it was a brilliant idea and that it could be the ideal starting point for a musical collaboration,” she added. It will lead to the more difficult task of identifying the similarities in Indian ragas and Chinese scores, realizes Yuening. “Let Kolkata and Tagore songs be the launching pad. I will have done my bit for music if I can accomplish the task,” signed off Yuening. Usually I don't read article on blogs, however I wish to say that this write-up very forced me to try and do it! Your writing taste has been surprised me. Thank you, very great post. It's really a great and helpful piece of info. I am glad that you shared this useful info with us. Please stay us up to date like this. Thanks for sharing. Generally I don't read article on blogs, but I wish to say that this write-up very compelled me to take a look at and do so! Your writing taste has been amazed me. Thank you, very nice article. we'd like work out extra techniques in this regard, thank you for sharing. . . . . . Very great post. I just stumbled upon your blog and wished to say that I've truly enjoyed browsing your weblog posts. In any case I will be subscribing for your feed and I am hoping you write once more soon! May I simply just say what a comfort to find a person that actually understands what they are discussing on the internet. What's up i am kavin, its my first occasion to commenting anywhere, when i read this paragraph i thought i could also create comment due to this brilliant paragraph. My blog has a lot of completely unique content I've either created myself or outsourced but it seems a lot of it is popping it up all over the web without my permission. Do you know any techniques to help protect against content from being stolen? I'd genuinely appreciate it. It's a pity you don't have a donate button! I'd without a doubt donate to this outstanding blog! I suppose for now i'll settle for bookmarking and adding your RSS feed to my Google account. Great post. I was checking continuously this blog and I'm impressed! Extremely useful information specially the last part :) I care for such information a lot. I was looking for this certain information for a very long time. Thank you and best of luck. You certainly put a brand new spin on a topic that's been written about for a long time. Excellent stuff, just excellent! Hi there, its pleasant post concerning media print, we all be familiar with media is a impressive source of facts. posts, I thought I just give thanks and Lift up a excellent practice.